London: W. Strahan ... 1777. Thick 4to. Orig. full old calf rebacked to period style with contrasting morocco titling-labels to spines. With engrv. portrait & folding table in Vol. I. 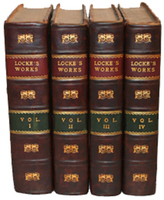 A fine attractive set of the English philosopher's (1632-1704) works including 'An Essay Concerning Human Understanding' as well as his work on coinage and the economy.